Supporters of Arizona’s cherished Salt River wild horses have received an early Christmas present, with news that federal authorities have decided to withdraw an impound notice. The US Forest Service published the impound notice late in July, putting at risk the 100 or so horses that live along the Salt River, which flows through Tonto National Forest. The notice caused a public outcry, with the Salt River Wild Horse Management Group (SRWHMG) mounting a well-organized social media campaign to save the horses. The Forest Service backed down in a matter of days, putting in place a 120-day suspension of the impound notice following negotiations with the SRWHMG. The group yesterday released a statement saying the Forest Service had indicated its intention to withdraw the impound notice. Since August, the SRWHMG, the local community, the American Wild Horse Preservation Campaign and the Animal Recovery Mission have worked toward getting the notice cancelled, in order to allow time to negotiate an agreement for the long-term protection of the horses. 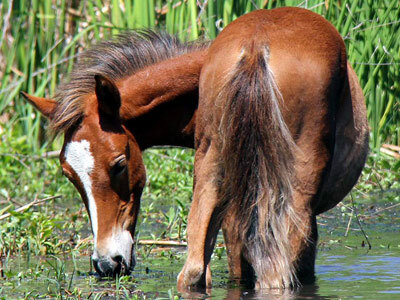 The horses are a tourist drawcard, and can often be seen wandering into the river to graze the aquatic grasses. The horses do not receive any protection under the 1971 Wild and Free-Roaming Horses and Burros Act because they live outside formally designated herd management areas. Last Friday, the Arizona US House delegation, led by Congressman Matt Salmon, sent a letter to US Secretary of Agriculture Tom Vilsack urging the Forest Service to move quickly to implement reasonable, humane solutions and protect the horses where they live. The letter encouraged the agency to work with the community and questioned why the horses could not be managed under the 1960 Multiple-Use Sustained-Yield Act. Last week, SRWHMG president Simone Netherlands met with Tonto National Forest supervisor Neil Bosworth and received assurances that the agency was committed to working toward a long-term plan for the humane management of the horses. Netherlands welcomed the agency’s decision to back away from its roundup plan. American Wild Horse Preservation Campaign director Suzanne Roy said: “While much work remains to be done and many details to work out, this is a very positive step toward protecting these horses, who are clearly valued by the public. The SRWHMG has lobbied hard for the horses and also filed a federal lawsuit seeking an injunction to stop the roundup. It later dropped the case as a sign of good faith in an effort to continue negotiations with the Forest Service. Arizona’s political leaders, including Governor Doug Ducey, Senators John McCain and Jeff Flake, and Congresspersons Matt Salmon, Trent Franks, Martha McSally, Ann Kirkpatrick, Raul Grijalva, Kyrsten Sinema, Ruben Gallego and David Schweikert, have expressed support for their constituents’ desire to establish long-term protection for the horses. Netherlands continued: “The continued freedom of these wild horse families means a great deal to the American people.